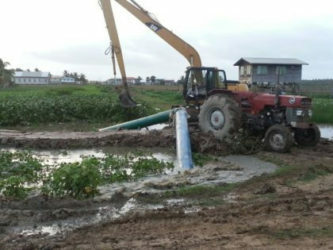 The flooding in several Region Five villages could have been avoided if the two big pumps located at Trafalgar were not vandalised, head of the drainage authority Fredrick Flatts said, even as other communities located along the Mahaicony Creek yesterday reported major flooding. Flatts, the head of the National Drainage and Irrigation Authority (NDIA), told Stabroek News yesterday that the deployment of several pumps has resulted in a noticeable drop in water levels. 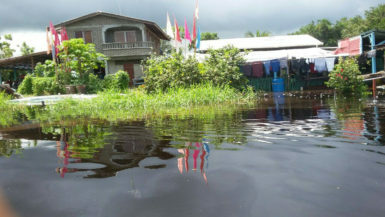 He said residents of several villages remained under several inches of water yesterday but predicted that if there is no more rainfall, the water will be off the land by tomorrow. 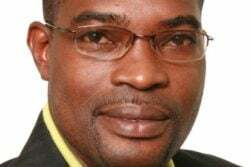 When Stabroek News contacted Flatts during the mid-afternoon hours, he related that he was on the ground assessing the situation. He said too that he was communicating with residents and had one in his company at the time of this newspaper’s call. According to the official, two pumps were in place at Trafalgar to provide adequate drainage but they were vandalised two years ago. 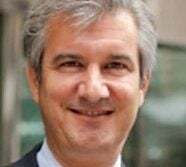 “We have two big pumps at Trafalgar which are capable of discharging 130,000 gallons per minute [but] they were vandalised,” he said. Asked why it is taking the NDIA so long to have those pumps repaired and back in operation, he explained that the delay is due to a lack of finances. “NDIA will need about $40 million to put them back into operation,” he informed. According to Flatts, had those pumps been working “we would not have this flooding.” He informed that the NDIA is looking to repair one by year-end. 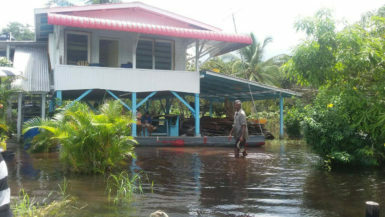 Stabroek News had previously reported that there was deep flooding in parts of Region Five and with floodwater coursing down the Mahaicony River, and as farmers and householders counted their losses, questions were being raised as to why the drainage authority was not doing more to relieve their plight. Heavy rain last week in the Mahaicony watershed flooded Moraikobai in the upper reaches and was a clear indicator that communities downstream were at risk. The chairman said he promised to approach the Minister of Agriculture and the authorities for assistance such as food items and medical attention. The communities are populated by farmers who mostly invest in cash crop farming and cattle rearing. Some have suffered major losses including damage to their household items and destruction of crops which they depend on for an income. One resident, Pamela Persaud, told Stabroek News that her three grandchildren have been unable to attend school due to the flooding. The children, she said, also fell ill with fever and cold. “We are calling for emergency help because since this flood we can’t move to go anywhere and nobody ain’t got time with we,” the woman lamented. Persaud said she felt neglected under the present government. “Before time when this happen we use to get food stuff and netting and so fuh them children, now not even a thing we not getting,” she said. 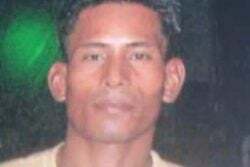 Her husband, Dhaniram Persaud, related that his entire garden is under water and while he attempted to pump out the water, he did not manage to save anything. He said he has suffered huge losses with all his cash crops such as bora, boulanger, pepper, ochro and sweet potato being destroyed. “This situation get out of hand. Almost every time rain fall we does get flood and recently it got worse,” he said. Several families were forced to move to other relatives’ home until the water recedes while others had to seek higher ground for their cattle. Many who shared their experience with Stabroek News related that since the flood, they have been unable to earn and they are now hoping that the rain would ease soon so that they can continue with their normal lives. Another resident, Gajraj (only name given) is calling on the authorities to compensate him. He said this is not the first time he is experiencing such a situation. “Right now a lot of nonsense happening in here and the government need to look into it,” the man said as he expressed frustration. Gajraj related that he had planted some 800 bags of paddy, half of which has been already destroyed. The man said that he has already lost about 30 to 40 acres of rice due to the flooding and to recover from this loss would take months. Meantime, the Government Information Agency (GINA) reported that action is being taken to bring the flooding in Region Five under control. It has that the water had begun to recede in some areas. GINA did not mention the communities along the Mahaicony Creek. According to the report, the areas currently flooded in Region 5 are Lovely Lass, Golden Grove, Trafalgar and Number 29 villages. It blamed the flooding on the recent excessive rainfall, the inoperable pumps at Trafalgar, the siltation of the sluice outfall channel at Trafalgar; and the presence of much vegetation in many village channels. GINA said that the NDIA and the Mahaica/ Mahaicony/Abary/ Agricultural Development Authority (MMA/ADA) have launched an aggressive programme to bring the situation under control and it is expected that as a result of these interventions, water will continue to recede. The MMA/ADA and NDIA have deployed a pump to the Trafalgar sluice while another has been sent to Bush Lot Village. Another pump is being moved from the Canje River and was expected to commence working yesterday afternoon at the Trafalgar Sluice. Further, four excavators have been moved to the flooded area with two working at Trafalgar north, one at Trafalgar south and one at Golden Grove north, GINA reported. Additionally, GINA said that two tractor pumps are currently draining floodwaters in the residential areas of Golden Grove north and Trafalgar north and two others have been deployed to drain the residential area of Trafalgar south. Consequently, GINA said, by late Friday, the floodwaters receded by two to three inches in the residential areas of Golden Grove north and Trafalgar north and south. It pointed out that the MMA/ADA and NDIA have been working in conjunction with the Region Five council and the relevant neighbourhood democratic council. Further, GINA pointed out that the outfall channel at Trafalgar sluice was dredged by the NDIA in early May 2016 but was silted up after a few days of sunshine as a result of reduced flows. It also said that one of the two vandalised pumps at Trafalgar is scheduled for rehabilitation by the NDIA before the next rainy season. GINA reported that it is projected that over the next three days, water will continue to recede bringing an end to the flood by tomorrow. This projection assumes that there would be no significant rainfall on Saturday and Sunday, it cautioned. Flatts yesterday told Stabroek News that he had passed three of the four tractor pumps and they were all working. He added that he had passed through Trafalgar moments earlier and only about four yards still had water. 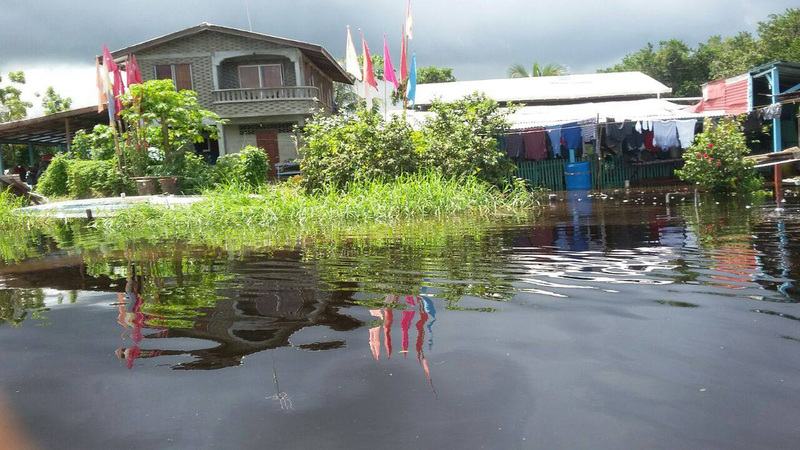 At least one resident in the affected region had reported to Stabroek News that this is the first major flood in the area since 2002.